Let’s just dissect that name a bit. Who doesn’t like The Landlord’s Daughter scene and sing-along from The Wicker Man? Youtube aren’t able to help me with a clip so you’ll just have to look it up yourself or watch the film. It’s also a name that conveniently rhymes with Porter and the lyrics are somewhat appropriate and suitably risque. So, this was supposed to be an oatmeal stout, but due to colour just not going the right way for me, it’s probably going to be more of a robust oatmeal porter. The OG over-shot considerably too, but I think that’s a lot to do with having the “help” of an eighteen-month-old Jacob who wanted to see, poke and prod about with the grains when I was weighing up. What I actually ended up with is a wort that tastes like it should be a smooth roasty stout, but is actually a nice portery-colour and is waaaay stronger than I intended (1063!). Needless to say in order to bend the style definition further, it will have a Belgian influence – because it’s being fermented with safbrew S33 yeast at about 20C. I chose to go with the Carafa II (de-husked malt) and not to go the black malt or roasted barley route, as I wanted an uber-smooth and roasty taste without that charry-bitter edge that some stouts can have. The chocolate and crystal malts should go some way to filling the gaps between the roast and the pale malts and add some roundness in the taste, too. 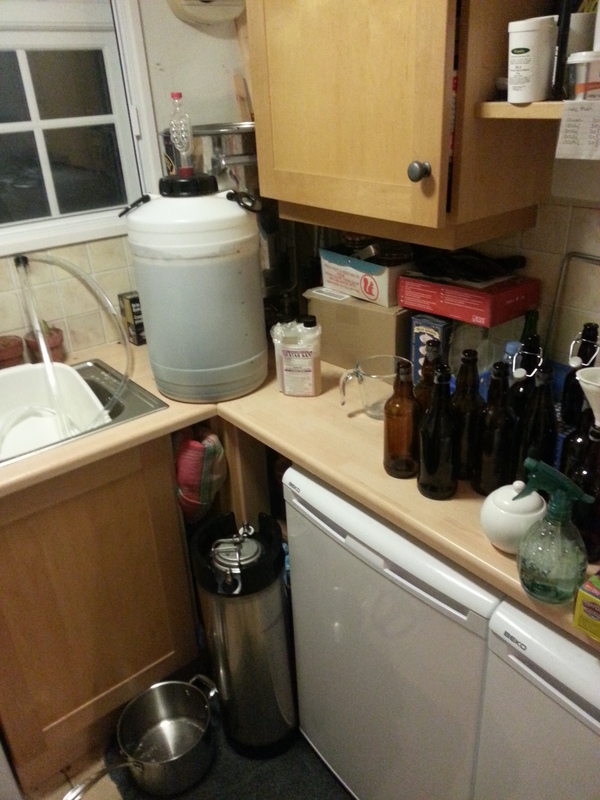 Oh yes and did I mention that I’ll also be bunging in 40 grams of coffee beans into the fermenter, too? If it’s good enough for The Mad Fermentationist, (http://www.themadfermentationist.com/2014/10/american-blonde-ale-with-coffee-beans.html) then it’s good enough for me. 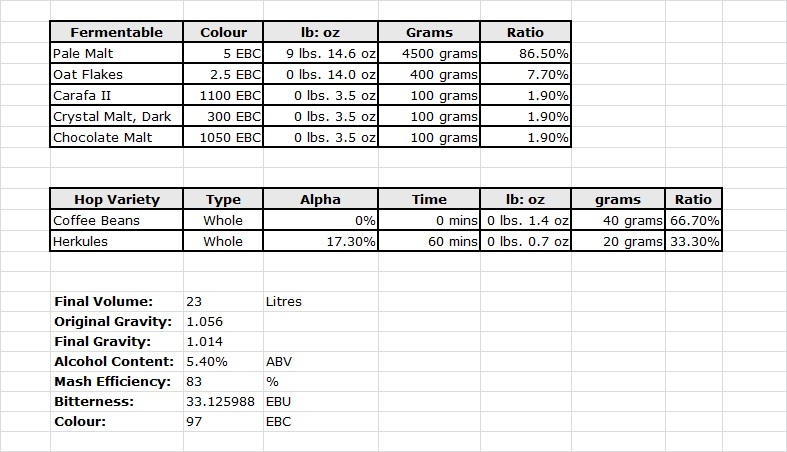 Happily, this was the most trouble-free brew session for a long-time and was also the fastest by far: just one hop addition at 60mins and no further additions, hop stand or anything meant I was done in a very short order. Also, as we’re doing this in a Braumeister, it means that even with 400g of oats in it, there was no chance of a gloopy sticky mash. Again I must stress that brewing in a Braumeister is a complete joy…especially if you have kids and things to fit in around your brew day. Well. Hasn’t it been a long time since I made this https://yeastismybitch.com/2014/09/23/beer-kit-dark-star-festival-ale-all-grain-kit-from-brewuk/? (23rd September, in fact) and hasn’t it been a long time since I promised the tasting notes..? Once the head has settled down to an acceptable level, the aroma is very fruity indeed (and that’s “fruity” in a good way) I suspect that this has a lot to do with the temperature during fermentation – the last gasp of summer forced it up to the low 20’s Centigrade, whereas I would have much preferred 19C or lower. The body is first-class and the taste is all lovely and malty. The yeast notes come in after the malt and help to round out out the taste very nicely; and right at the very end, and continuing into the after-taste, a very smooth bitterness splices itself in and helps to encourage further consumption. All in all this is a very good kit indeed…and if you want to make it the best you possibly can, splurge on the fancy liquid yeast option (WYeast 1098 or White Labs 005) and -unlike me- try to keep the fermentation temperature under control! …and how I also love the output of the folks from the Town Mill Brewery in Lyme Regis. Black(!) 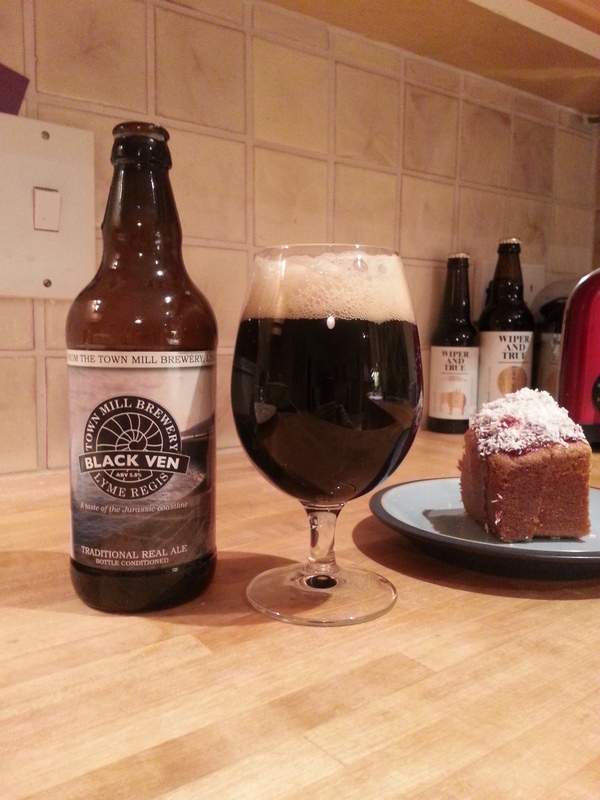 Ven pours a very suitably black, black, with a nice faintly off-white head. The nose is all minerals and malt with a subtle fruitiness. There’s lots of carbonation up-front before you get to the taste and then it’s all warm alcohol, complex woody and fruity notes and then a very gentle charred note at the back. A good mouth-feel – despite the slightly generous carbonation. Black Ven gets even more complex after the swallow and resurges nicely with leather and wood and more gentle char. I think this is a lovely, complex porter – but I do wish it was a tad less carbonated.